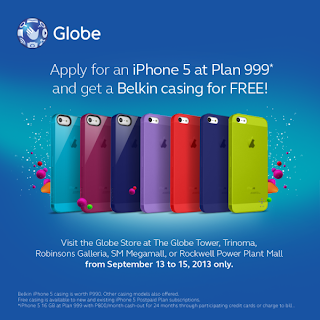 Here’s a deal from Globe subscribers who want to avail iPhone 5 under Plan 999, you will get a free Belkin casing for your handset. Just visit Globe store at the Globe Tower, Trinoma, Robinson’s Galleria, SM Megamall, or Rockwell Power Plant Mall from September 13 to 15, 2013. Enjoy and take home this free accessory only from Globe Postpaid subscribers who avail iPhone 5 plan. To those who are asking how much is that colorful case, the price is 990 pesos. 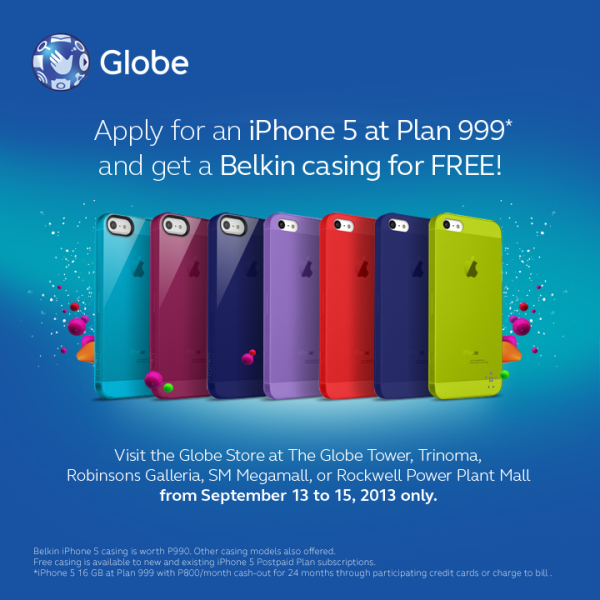 Free casing is also available to existing and new iPhone 5 Globe Postpaid subscribers. For more details, you can visit your nearest Globe stores.